It is common knowledge that e-learning developers use various authoring tools to develop online courses. Most important of these are rapid authoring tools such as Articulate Storyline and Adobe Captivate that are used to create highly interactive and engaging digital courses. In addition to these rapid authoring tools, a few other tools such as Adobe Presenter 11, Adobe Premiere Pro CC, and Flipbook Maker Pro.4 are also used by e-learning developers. Why and where are these tools used? 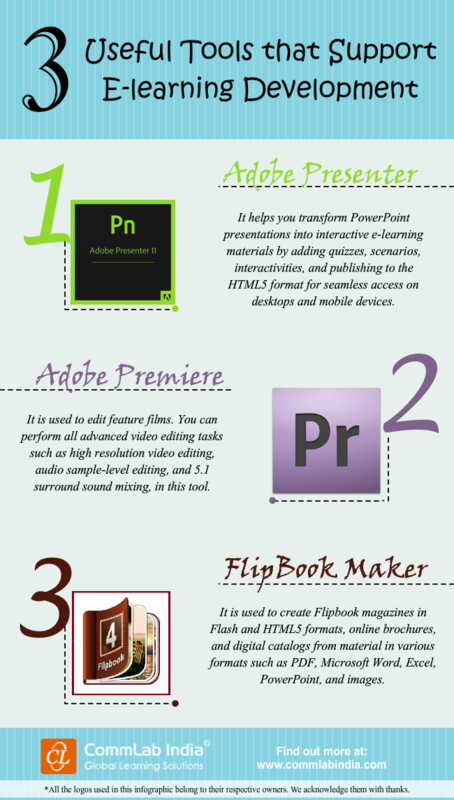 Check out our infographic for more information on these 3 tools.